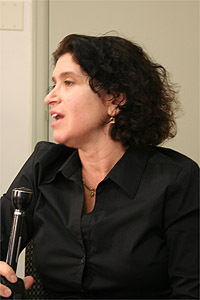 Jennifer Kaplan speaks at Bethesda Green. One author and two Pepco program representatives brought a big message for small businesses to Bethesda Green, Tuesday, March 9: Going green can save your business money, with a modest amount of effort. Jennifer Kaplan discussed her book, ‘Greening Your Small Business,’ which came out last fall. Her top three tips: Use less, buy and source locally, and start small. In the use less category, she recommended turning off your company’s computers at night to save energy. Also, consider getting rid of your fax machine and instead sending and receiving faxes electronically (this saves paper and electricity). Buying and sourcing locally means you’ll pay lower transportation costs for those items (and eliminate environmental impacts of long-distance transport). Buying locally also supports the local economy and has a cultural impact in your community—you get to know your suppliers, who are more likely to help you with custom orders. As for starting small, Kaplan said businesses should consider doing the little things—such as buying recycled products and using less paper—that can add up when multiplied by the 29 million small businesses in America. Her book offers dozens more tips and examples of small businesses implementing green practices across the country. Kaplan is an adjunct faculty of marketing at Marymount University in Arlington, Va., and founder of Greenhance LLC, a business consultancy that provides marketing and communication strategies to small businesses going green. The two other speakers, Nick Keller and Manuel Vera of Pepco’s Commercial & Industrial Energy Savings Program, discussed how small businesses can qualify for rebates for making energy efficiency improvements. 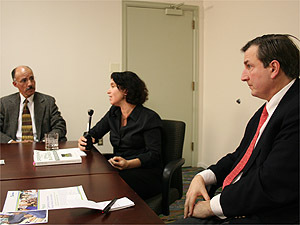 Keller noted that companies can save about 30 percent on their energy bills with very little effort. The program helps offset costs for energy efficient upgrades in three ways: providing rebates of certain dollar amounts for certain products, such as lighting; providing custom rebates for other energy-saving solutions companies come up with; and reimbursing energy efficiency training costs for building managers, up to $1,000 or 80 percent of the training. In addition, the program has a network of trade contractor allies that are pre-approved to do energy efficiency work. Some 20 people attended the lunchtime event and there was a lively Q&A after the presentations. Access Montgomery TV filmed the event; they’ll use some of the footage in the ‘Think Green’ TV show, which airs Saturdays at 3:00 p.m. on Channel 21 on RCN, Comcast and Verizon services. Bethesda Green Executive Director Dave Feldman noted that Bethesda Green will be launching a program for small businesses in May, in partnership with the Bethesda Chamber of Commerce. Stay tuned for details. Do you know ways small businesses can go green and save money? Have you implemented such actions at your small business? Post your comments here! With back-to-school planning and purchasing kicking into full gear, now’s a good time to consider ways to go green. Our friends at OrganicMania have assembled a comprehensive listing of back-to-school tips — Green Moms Tell It Like It Is — a great resource for parents. If you’re interested in getting actively involved in sharing ideas with your schools and PTAs, check out and distribute two great information flyers recently produced by Bethesda Green. One covers green options for purchasing school supplies; the other presents ways to implement waste-free lunches at your school. Both flyers are PDF files that you can download and distribute electronically.